Two O’clock Creek – Poems New and Selected brings together the best of Bruce Hunter’s previous books of poetry as well as exciting new work that shows the sustained development of a life-long poet. Highly acclaimed by Books in Canada, the Calgary Herald, The Globe and Mail, and Canadian Literature, twice short listed for the CBC literary prize, and selected as a People’s Choice winner, Hunter is a poet who goes to the core of life. These poems reveal the mysteries of rivers, the secrets of spurned loves, the lives of workers and the joys and heartbreak of new immigrants, always against a carefully drawn backdrop, whether urban or rural. The unequivocal and unflinching emotions here move from awe to anger to whimsy in an authentic voice that is in turns, tender, scathing and celebratory. 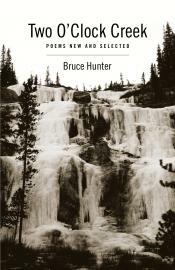 "Two O’clock Creek" is the “seed” poem which inspired Hunter’s novel, In the Bear’s House, which won the 2009 Canadian Rockies Award at the Banff Mountain Festival.